When early rumours suggested that the newest Kamen Rider would be a wearing a bright pink bodysuit and a helmet that sported moulded pink hair and cartoon-styled eyes, most dismissed it just like they would any earlier Rider/Sentai rumours. But when Kamen Rider Ex-Aid was fully revealed to the public those rumours turned out be true, unveiling a video-game themed Rider that’s quite unlike anything seen in the franchise’s 45 year history. Forget ghostly hoodies and Eyecons, now comes the time of gaming and Gashats. Written by Yuya Takahashi (Drive’s Type Tokujo specials, Lupin III Part 4), Ex-Aid is the 18th Heisei era Rider series and the 27th overall. Emu Hojo is an avid gamer and Paediatric Intern at Seito University Hospital. These interests ignited at the age of eight, where he was given a games console by a doctor who had saved his life from an illness. One day Emu finds one of his patients infected by a mysterious virus, the Bugsters – born from video game bugs and able to manifest in the real world. Using the Gamer Driver and the Rider Gashat, Emu – also known by the alias of the Genius Gamer ‘M’, is able to become Kamen Rider Ex-Aid and save his patients from this new electronic threat. With retro and nostalgia being the in-thing at the moment, Kamen Rider Ex-Aid couldn’t have come at a better time. The show goes at its video gaming motif with full force, with Ex-Aid himself being based on the in-series platform gaming hero ‘Mighty’. Each Rider (three of whom we get a glimpse of in the episode) is based on their own genre, and in a rather nice touch all them appear as part of the “character select” transformation sequence. 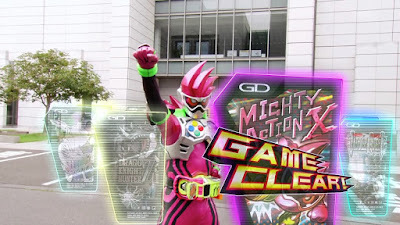 Once Ex-Aid is on the scene literally everything is treated like a video game, from the retro jumping sound effects to item blocks and on-screen animations each time he lands a hit. His rider kick is a combo, and he even blows on his cartridge before inserting it for the finishing move! It’s often ridiculous, but the conceptually straightforward and doesn’t bring in too many side elements to water down the main theme. As far as first impressions go the characters seem like a lot of fun, with the show attempting to balance playing its storyline relatively straight with an abundance of slapstick comedy sequences. Some moments are pulled off better than others, but in general the episode did a fairly good job of it. Emu’s a good natured lead with a wealth of back story potential (both as a med student and ‘M’) and the episode also gave us a glimpse into the wider plot featuring the GENM Corporation, the Ministry of Health and Asuna/ Poppi Pipopado (ignoring the quality of the name). Ending the episode with snippets of the other Riders was also great, working as a great tease and showing off their personalities in a few brief moments. The fights are not going to be to everyone’s tastes though. Embracing the theme is one thing, but doing so with a garish pink suit with anime eyes and a lime green Driver is another matter entirely. There have been shows where the lead looked “un-Rider-like” before (Hibiki, and to a lesser extent Wizard), but nothing quite like this. The aesthetic is so out there than other than the inclusion of a Driver this could easily pass for a totally different henshin hero show. Similarly the super deformed level 1 suits may capture the spirit of the theme, but that doesn’t change how ridiculous they look. For some it’ll be the good kind of ridiculous, but for many it won’t. Like a typical Kamen Rider first episode Ex-Aid went overboard on the spectacle, but just how much it adhered to the retro gaming look may have also cost it in some areas. The CGI Level 1 Bugster may supposed to represent a basic humanoid enemy from a retro game, but onscreen comes across as a pretty sore sight. CGI monsters aren’t particularly good at the best of times, so getting them as bobby, orange messes might not be a good way forward. Still, the CGI raises the question of just how much they’ll be used as the series go on – much like the Riders’ far more limited level 1 forms. However if there’s anything that shows such as Ninninger or Kamen Rider Ghost have taught me in the few years, it’s that a first episode is rarely indicative of a year-long show’s overall quality. In that sense, doing a first impressions review seems almost redundant. So instead of saying that Kamen Rider Ex-Aid is shaping up to be a good/bad series, I’ll say that Kamen Rider Ex-Aid is certainly going to be a DIFFERENT one. The wacky suits and garish colours will put off just as many people as they attract, but beyond that Ex-Aid has shown itself to fully embrace and have fun with its core concept. It’s unlikely to be the show anyone is quite expecting, but with a franchise that’s been going on as long as it has that doesn’t necessarily seem like a bad thing.